Close to the beach with your own private solar heated pool and multiple decks, this vacation home is everything you could ask for! Perfect for a family member that requires everything on one floor with no steps. BLUE BY YOU sits on a beautiful canal that leads to Back Bay and while standing on the third level deck you can see the ocean and bay at one time. Six bedrooms (two master bedrooms, one on each level), four bathrooms, two living areas, open kitchen and dining area will give you more than enough space to spread out or spend your vacation together with family and friends. A small library of books, movies and games or the basketball hoop will keep everyone entertained after the long day at the beach or at the pool. Plentiful seating in the screened sun porch with ample space for dining/gaming with mini-fridge around solar heated pool. Decks will guarantee everyone the perfect seats for watching the sun go down over the bay. Don't forget your kayaks and canoes with easy access to Back Bay right from the property! Ground-Level: Living Area with three couches, LCD TV, Kitchen, Dining Table seats 10, Access to Screened porch with mini fridge, Laundry room with full size washer and dryer, Hall Bathroom, Queen Master with LCD TV; Bedroom with 2 Twins and a Futon. 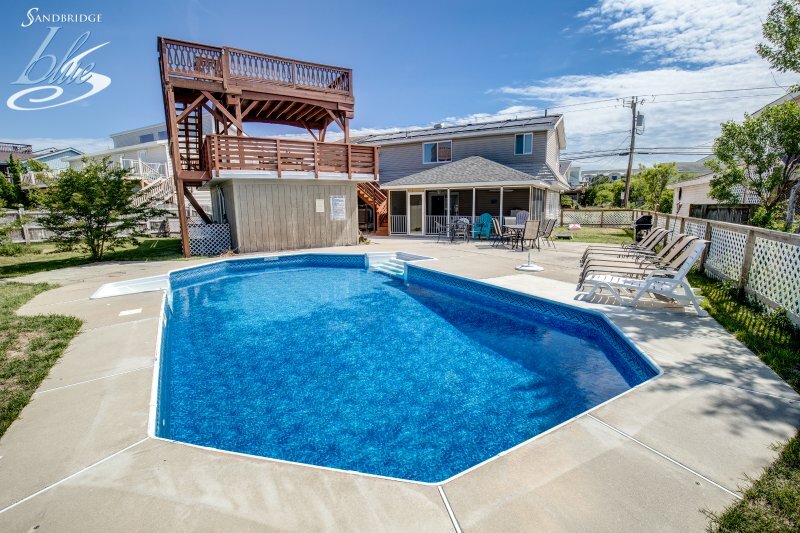 Extras: Private Pool (solar heated pools are weather dependent 32'x18') Wireless Internet Access, Foosball Table, Air Hockey, 2 Full Size Refrigerators, Basketball Goal, Corn Hole, No Smoking, PETS NOT ALLOWED, Parking: 6 Cars, Distance to the Beach: 557 ft. Private pools are open from May 3, 2019 until October 6, 2019. This property is not equipped for pool heat. Pool heat is not an option for this property. Close to the beach with your own private solar heated pool and multiple decks, this vacation home is everything you could ask for! Perfect for a family member that requires everything on one floor with no steps. BLUE BY YOU sits on a beautiful canal that leads to Back Bay and while standing on the third level deck you can see the ocean and bay at one time. Six bedrooms (two master bedrooms, one on each level), four bathrooms, two living areas, open kitchen and dining area will give you more than enough space to spread out or spend your vacation together with family and friends. A small library of books, movies and games or the basketball hoop will keep everyone entertained after the long day at the beach or at the pool. Plentiful seating in the screened sun porch with ample space for dining/gaming with mini-fridge around solar heated pool. Decks will guarantee everyone the perfect seats for watching the sun go down over the bay. Don't forget your kayaks and canoes with easy access to Back Bay right from the property! Top-Level: Den with sleeper sofa, LCD TV, Deck Access. King Master with LCD TV; Queen Bedroom with TV; Bedroom with a Bunk Bed and TV; Bedroom with 2 Twins and TV; Hall Bathroom Ground-Level: Living Area with three couches, LCD TV, Kitchen, Dining Table seats 10, Access to Screened porch with mini fridge, Laundry room with full size washer and dryer, Hall Bathroom, Queen Master with LCD TV; Bedroom with 2 Twins and a Futon. Extras: Private Pool (solar heated pools are weather dependent 32'x18') Wireless Internet Access, Foosball Table, Air Hockey, 2 Full Size Refrigerators, Basketball Goal, Corn Hole, No Smoking, PETS NOT ALLOWED, Parking: 6 Cars, Distance to the Beach: 557 ft. Additional amenity details: Private pools are open from May 3, 2019 until October 6, 2019. This property is not equipped for pool heat. Pool heat is not an option for this property. All Sandbridge Blue properties provide bed linens, bath towels, beds made prior to your arrival, and a starter supply of: toilet paper, bathroom soap, paper towels, and dishwater detergent.